The PD55B000 is a brown panel designed for 50 Amp service only. The PD55B003 is a brown panel split 30/30. 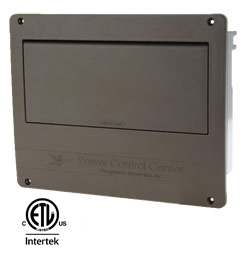 The PD55B006 is a brown panel split 50/30 that is intended for 50 amp service with a 30 amp "sub panel" useful for isolating several circuits to be powered by an inverter. 15 Amp/120VAC outlet on rear of AC Panel.